The XSELECT-D4 is best described as a progressive scan transcoder/switchbox with interlaced video pass-through. It's primary purpose is to accept progressive scan video signals via five separate inputs, and convert that signal to a 15-pin RGB output, basically VGA. Accompanying it is a miniature remote control that duplicates the functionality of the front panel buttons, a D-Terminal cable of pretty reasonable quality, a component to 21-pin RGB adapter, an extensive manual and a set of RCA audio cables. Unfortunately the manual is entirely in Japanese, but all labels are in English. Anyone with a modicum of knowledge regarding audio/video equipment will have little trouble assembling everything. Physically, the XSELECT-D4 is about the same height and width as a PlayStation 2, but not quite as deep. The quality of construction seems to be pretty good, much like other Micomsoft products in the XRGB series, which have stood up to heavy usage. The nomenclature of the inputs is Japanese, but compatible with western video signals. The D3 video standard supports 525i, 525p, and 1125i video signals. D4 is 750p in addition to D3. All except for 525i are at least nominally capable of being displayed on a VGA monitor. Two of the inputs are located on the front panel. One of these is a D-Terminal (labeled Input 4), the other a Japanese RGB (aka 21-pin RGB). Both are capable of accepting D3 video signals. The Japanese RGB port (labeled Input 5) can be configured for either RGB, or YUV, the latter for use with the supplied component to 21-pin RGB adapter. This is achieved through the system menu. On the rear there are three inputs and two outputs. Two of the inputs (labeled 1 and 2), have both D-Terminal and Component Video ports capable of accepting D4 signals. In both cases, only one of the two ports can be used at once. Input 3 has both a D-Terminal and a 15-pin RGB port capable of accepting the same signals as inputs 1 and 2. Once again, only one can be used, and it has to be configured correctly from the menu. To use the D-Terminal port, it should be configured as YUV. The 15-pin RGB can be configured for use with three types of synchronization. Sync on Green, Composite Sync, and separate Horizontal and Vertical Sync. Its purpose is not to act as a video pass-through for a computer, though it might work for a resolution of 640x480. All inputs have their own RCA audio ports. There are two output ports. Both are used simultaneously. The input signal is converted to both 15-pin RGB and D-Terminal, but is not otherwise changed. 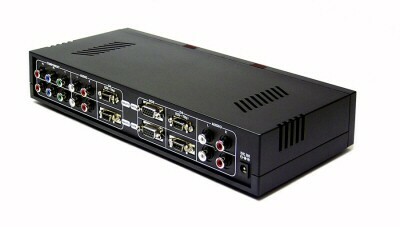 For example, a component video 525p exits as a 525p. Likewise an interlaced signal. This means that the 15-pin RGB can be connected to, for example, a VGA monitor, whereas the D-Terminal can be connected to something else. One example would be to a Micomsoft XRGB-2 Plus. At the front of the unit is a series of buttons. One is for power of course. Five are used to select which input should be used. Only one can be used at a time. If the selected input has a progressive scan signal, a little light turns on. Four buttons clustered together are used to display the status, change the screen ratio and navigate the system menu. The status button displays the input in use, and the horizontal scan frequency. The ratio toggles between three screen ratios (4:3, 4:3LB and 16:9) though experimentation revealed no obvious affect to the image on-screen. The menu itself is fairly extensive, and among other things allows the saturation of the video signal to be modified, and two of the inputs to be configured for either component or RGB as described above. These are probably the most useful of the options. Four consoles were used in evaluating the performance of the XSELECT-D4; a GameCube and a PlayStation 2, both equipped with D-Terminal cables, an XBOX outfitted with Component Video, and for the purposes of comparison a Dreamcast with a VGA adapter. Interlaced signals were handled by connecting the D-Terminal output to the D-Terminal input of an XRGB-2 Plus. Prior to this, the upscanned video quality of the first three consoles mentioned had been evaluated using an XRGB-2 Plus. The XBOX progressive scan signal had also been viewed after being transcoded by an Audio Authority 9A62. A Nokia 445Xi 21�h monitor handled the display. For the interlaced video signals there was some degradation in the image quality but at least with the PlayStation 2, it was minimal. The video signal from the GameCube is not quite as good as previously but it was still surprisingly good. The XBOX Dashboard, however, actually looks better. This is because to view the same signal on the XRGB-2 Plus it had been necessary to use the Component video to RGB adapter that is supplied with it, and this affected signal quality. The real surprise was the progressive scan image. It is significantly better than Audio Authority�fs 9A62. The color is deeper, richer. Graphics are noticeably crisper. The very first game used to test progressive scan image quality was Halo on the XBOX, and in comparison, the image from the 9A62 is somewhat washed out. Subsequent XBOX games reflected this improvement and GameCube games and SOCOM on the PS2 displayed the same quality. Micomsoft is to be commended. A comparison with the Dreamcast VGA adapter was the acid test, and looking at text and fine lines in both Halo, and Quake III Arena clearly showed that it is preferable by far to directly output a VGA signal as the Dreamcast does, rather than transcode a progressive scan component video signal to VGA. The biggest problem experienced with the XSELECT-D4 was the lack of any means to adjust the screen position. Every time a different console was used, it was necessary adjust the image to get optimum size and location. Those used to fiddling with the XRGB-2 Plus will find it second nature. The incoming progressive scan signals have sufficiently different frequencies to affect the size and position of the image. These can be compensated for via the monitor's adjustments, but a better solution would have been to provide these from the system menu, with individual settings for each input. The XRGB-2 Plus provides this at least as far as the horizontal position is concerned, and it is an extremely useful feature. At $189 US, the XSELECT-D4 is in direct competition with products like Audio Authority's 9A62, and clearly the AA 9A62 is outclassed. Anyone who would acquire one of these would be better advised to purchase the Micomsoft product. For the gamer that owns just an XBOX, products like the X2VGA are clearly going to be a preferred acquisition. They're cheaper, do a good job, and most of the games support progressive scan. The GameCube or PS2 owner would probably be advised to eschew progressive scan altogether, and go for one of the cheaper line doublers, such as those produced by Redant, or if they have more money, the XRGB-2 Plus. The most likely purchaser is the gamer that owns more than one console, an XBOX and a GameCube at the very least, and who is familiar with the benefits of progressive scan. Buying a separate VGA adapter for each console, at around $50 US apiece, and the necessity for two screens, one for each signal type, plus cable swapping makes the XSELECT-D4 worth considering, and such people will not be disappointed.